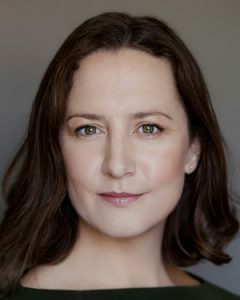 Aoife Molony, since graduating from The Gaiety School of Acting, has appeared in many leading roles in productions such as Anna Karenina at the Samuel Beckett Centre; The Man Who Came To Dinner and Lovers at The Chichester Festival Theatre; Oedipus at The Gaiety Theatre; Mansfield Park at the Civic Theatre (national tour); The Merchant of Venice at The Cork Opera House and A Dream of a Summers Day at The Civic Theatre (national tour). Her film and television credits include a leading role in R.T.E’s Killinaskully; Aelous directed by Shimmy Marcus for R.T.E; Amber directed by Thaddeus O’Sullivan for R.T.E; Parked (Ripple World Pictures) Standby (Black Sheep Productions). Most recently she has appeared in a short film called The Party directed by Andrea Harkin for R.T.E. Aoife has extensive experience as a radio and television voice-over. War Cabaret The Can Can Girl Jo Mangan Performance Corp.
7 Deadly Sins Lust Jo Mangan Performance Corp.
Graduate , Gaiety School of Acting 1998. Two years full time.